Coral reef ecology is at the forefront of national and international media attention because of the serious threats to these ecosystems from global climate change, disease and over-exploitation. As long ago as 1998, a global sea surface temperature event is estimated to have killed 17% of the corals of the world. Regional mass bleaching events are now common occurrences, often followed by disease outbreaks. My recent research has addressed two main foci in the study of coral health and disease: 1) the development of a culture-independent molecular microbial ecology approach to the study of emergent diseases in reef corals, and 2) The cellular and molecular responses of reef corals to infection and environmental stress, most recently in relation to cell death pathways and mucus secretion dynamics. The next phase of this research is to combine the molecular and cellular host coral stress responses with experimental manipulation of microbial exposure and environmental stress. As genomic information becomes available for corals and related lower invertebrates, post-genomic and proteomic approaches to stress and disease analysis have also become possible. From 2012-2015 I held the position of Deputy Vice-Chancellor (Research & International) at the University of the South Pacific, based in Fiji. The small island states of the south Pacific are at the forefront of global climate change impacts. Prior to that, I was a member of an international ‘Coral Reef Targeted Research’ programme investigating coral bleaching (http://www.gefcoral.org/) and more recently acted on the Western Indian Ocean Marine Science Association programme committee (http://www.wiomsa.org/). 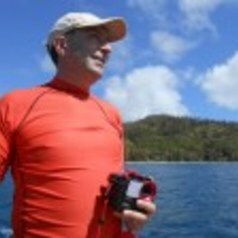 I am particularly concerned about raising awareness of the dramatic impacts of climate change in tropical coastal ecosystems (see video article at: http://www.climateshifts.org/?p=5779).